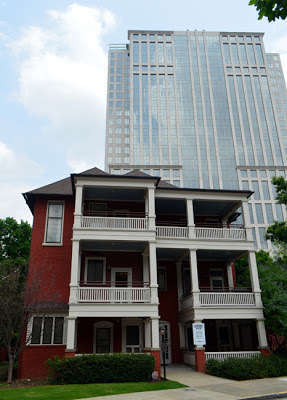 The Margaret Mitchell House is the first "artifact" of Gone With the Wind that I ever glimpsed. That was in 1987, a time that it lay in disrepair having suffered the effects of abandonment and age, and it would burn twice prior to being restored to its current day grandeur. 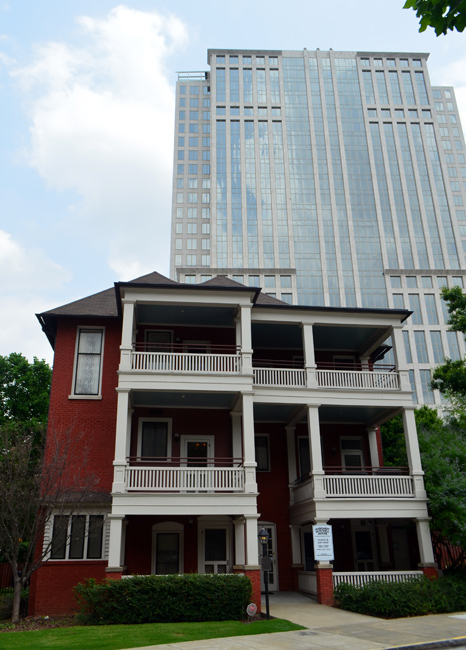 Today, the Margaret Mitchell House stands as a beacon for all tourists and especially Gone With the Wind fans—or "Windies," as I've heard them called. Now then, the House, as an attraction, doesn't have a huge amount of original memorabilia, but the ones it does have are quite significant. The portrait of Scarlett O'Hara used in the Gone With the Wind film, for example, is a treasure they're proud to have. I absolutely love this piece! This is the Peachtree Street view of the House. Visitors actually enter from the Crescent Avenue entrance at the rear. As a matter of fact, the house used to be called Crescent Apartments, but even before that it was a single family home. The house was build by Cornelius J. Sheehan in 1899—the year before Margaret was born—and not converted into apartments until 1919. Margaret Mitchell and her husband John Marsh moved in on their wedding day in 1925. There were 10 apartments and they lived in Apartment #1, which looking from Crescent Avenue is the bottom left unit. There's a lot more history to share, but I'll leave some of that to the docents—it's a great tour. On my most recent visit our tour guide was an enthusiastic woman named Margaret, which made it rather a special tour. There are self-guided tours and guided tours—and you'll want to do both because they don't fully overlap. Both are included with admission, but the guided tours are timed. Let me add a note here...if you're in a time crunch, I recommend calling ahead to make sure that the tour time you want is on schedule. The tour I arrived for had been cancelled and the next one would be 40 minutes later—they're on the half hour. No worries...I availed myself of the self-guided tour and the opportunity to make some exterior photos of the House before the guided tour portion of my excursion. The centerpiece of the detached exhibit space is the portrait of Scarlett O'Hara in a blue dress—the original painting that was used in the movie! 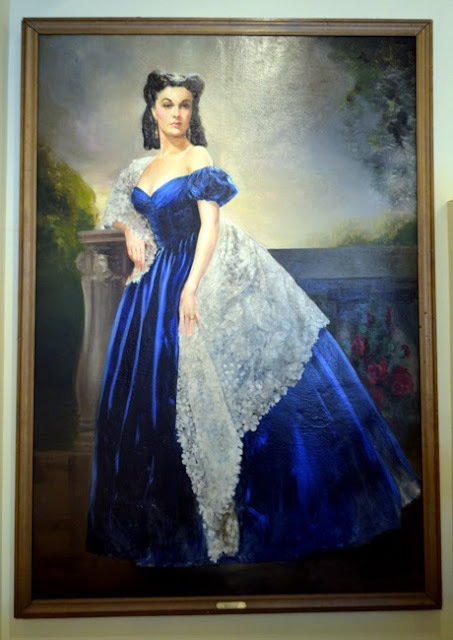 (first photo in the post) The life-size portrait was painted in 1939 by Helen Carlton and after the premier of Gone With the Wind, it hung in a department store and later in the Margaret Mitchell Elementary School cafeteria! 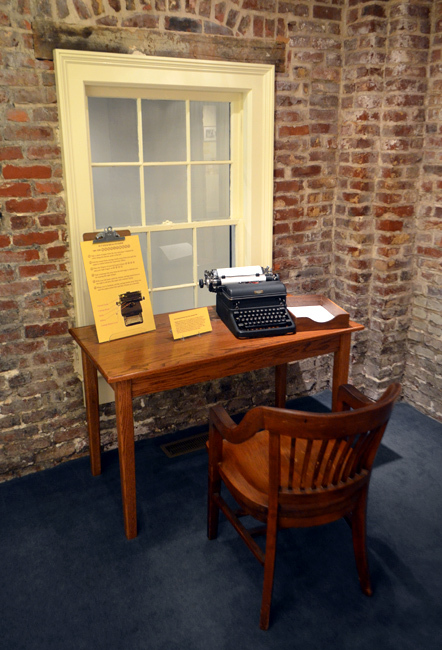 It's now here at the Margaret Mitchell House, on loan from the Atlanta Board of Education. 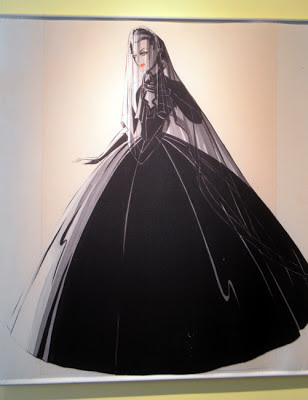 Also in this exhibit space are a number of drawings of costumes, sets, and landscapes from the film, some of which were used for portions of the opening credits. Another of the super-cool artifacts here is the original door from Tara! That's right...this beauty has survived nearly 80 years of the elements, storage, change of ownership, and who knows what else. Following the film, the door was left in the elements for 20 years, and it was used in at least one other movie. 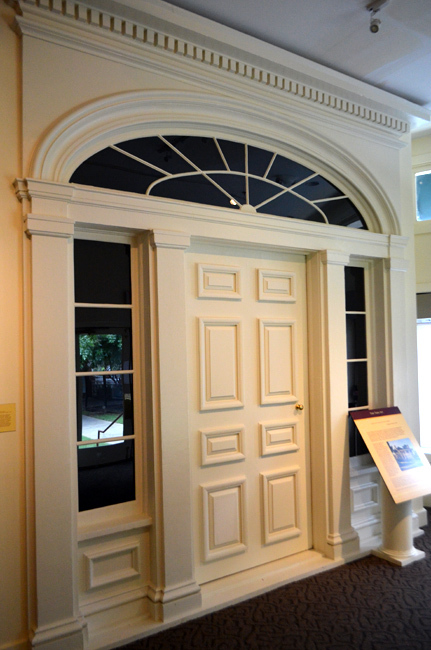 In 1959, the door was disassembled, but cataloged for future reconstruction. 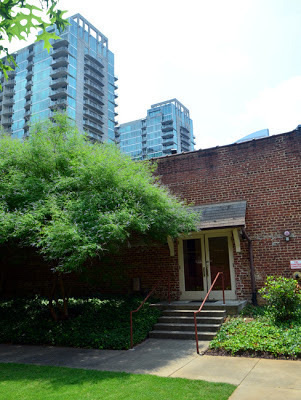 The door disappeared for another 20 years—mostly in storage during that time—and then was purchased by former First Lady of Georgia Betty Talmadge. For the 50th anniversary of the film, 1989, the Atlanta History Center had the door fully restored, using practically all the original material. I've mentioned this in other posts, but it was in 1989—the 50th anniversary of the film—that I first saw Gone With the Wind. And I saw it at the Fox Theatre, across the street from the Georgian Terrace where Vivien Leigh and Clark Gable stayed during the 1939 premier. There are a number of placards throughout the exhibit space that tell of various aspects of the book and the film...take time to read these. And speaking of the film, there's a two-hour documentary, playing on a loop. "The Making of a Legend" (1988), was produced by the sons of David O. Selznick, Jeffrey and Daniel. The film chronicles the making of Gone With the Wind and includes some super-fun-to-watch screen tests of actors and actresses including Bette Davis and Lana Turner! Back to the House...the exhibit space is part of the self-guided and the guided tours. The actual apartment is guided-only. In the House exhibit space are a number of fascinating artifacts that tell of the life of Margaret Mitchell, her journalism career, and her experience of writing Gone With the Wind. 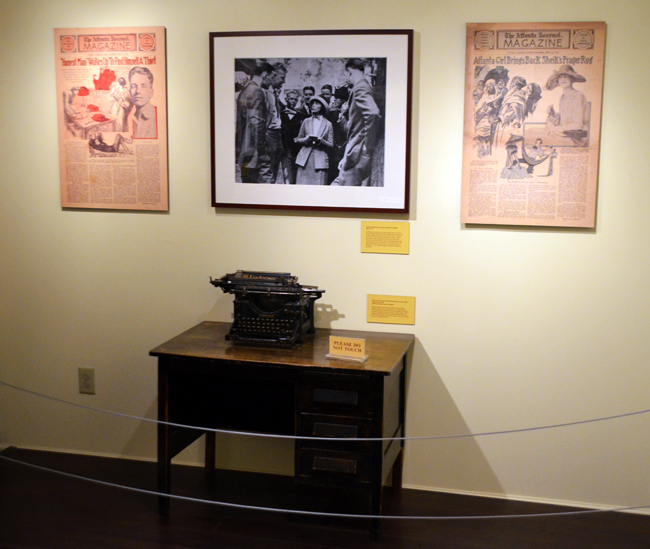 Among the artifacts is Margaret Mitchell's desk from her time at the Atlanta Journal. Just above the desk is photograph of Margaret conducting an interview, which clearly shows her modest stature—she was a mere five feet tall. You'll notice that her desk was of a size to accommodate her small frame, but not by design...it was by saw. That's right...they cut off the legs of her desk to make it more "ergonomic" for her size. That was a simpler time. Although there are two typewriters in this space, neither belonged to Margaret Mitchell, but they're both from the same era. The one pictured immediately above comes with an invitation to try it out. I didn't get it at first...this thing is an antique! But then it dawned on me. There's more than one generation out there that has never worked on a real typewriter! So, the what seemed to me to be way over simplified instructions of how to use a typewriter is actually rather progressive thinking. 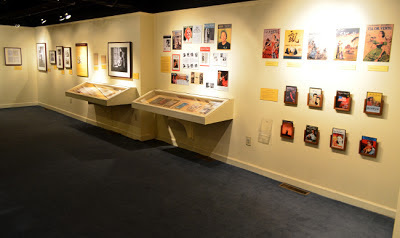 There are also photographs, magazine covers, manuscripts, and lots of copies of international book covers—made into a game—also on display! After touring the exhibit space, we headed to the apartment where Margaret and John lived for quite a few years. 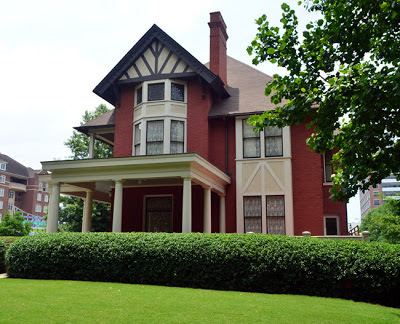 As a matter of fact, Margaret wrote approximately 90 percent of the 1,037 typed pages of Gone With the Wind, her only novel, while living in this house. The apartment wasn't quite what Margaret was used to—it's really small, by most standards—and she affectionately dubbed it, "The Dump." Their apartment is there on the bottom left, Apartment #1. Photography is not allowed inside the apartment, but that's alright...very little is original—a fixture here and there—although the furnishing are period, and I need to leave something for you to experience in person! Actually, there's a lot to experience...even though I feel like I've been writing this post for days, I've barely scratched the surface. 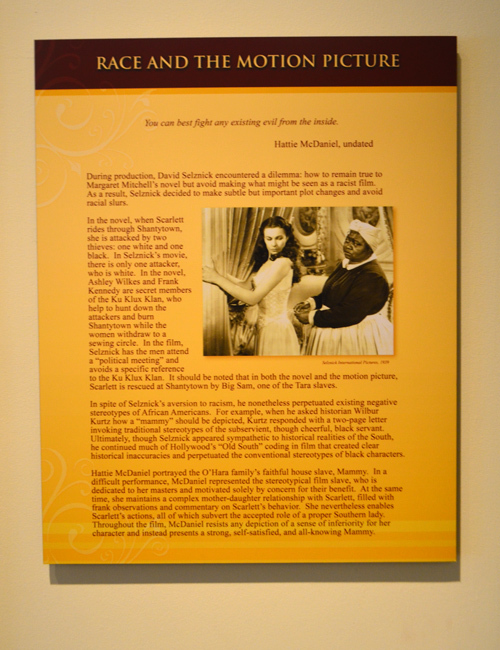 So, be sure to allot lots of time for your visit to explore the home of Margaret Mitchell and the birthplace of Gone With the Wind. This book is great! Yet it does not have the line "Frankly my dear I don't give a damn!" that we're all so familiar with. Mitchell has created a truely wonderful novel, that you will enjoy from cover to cover. Neither main character has particularly good qualities (apart from them both being good looking) yet you can't help but like them. I want to be Scralett and I love Rhett Butler! The portrait of Scarlett did not hand in the cafeteria at Margaret Mitchell Elementary School. It hung in the auditorium, along with a similar portrait of Rhett Butler. I was president of the PTA during one of the six years my son attended Mitchell, so spent 3 or 4 days a week at the school. Yes, I'm absolutely sure where the portrait was hung. I like that they made the copies of the covers into a game.